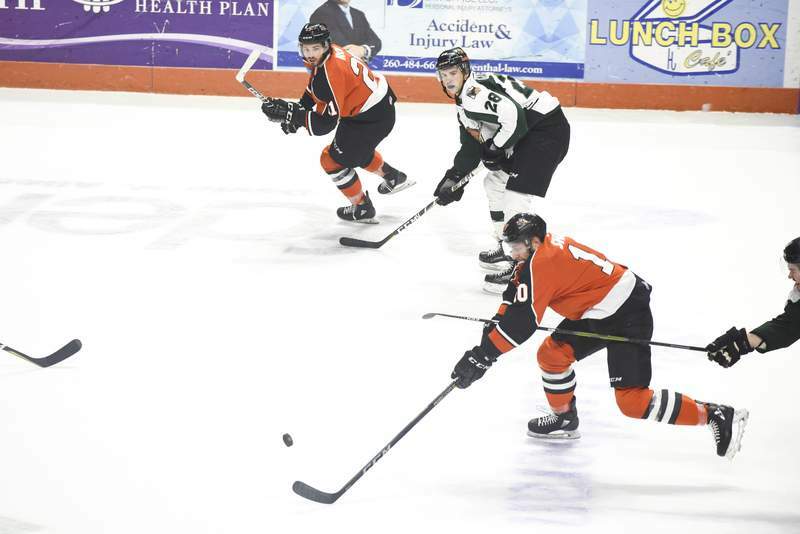 Brett Luke | The Journal Gazette Matthew Weis of the Komets and Utah's Jake Marchmen face off for control of the puck during the first period at Memorial Coliseum on Saturday night. 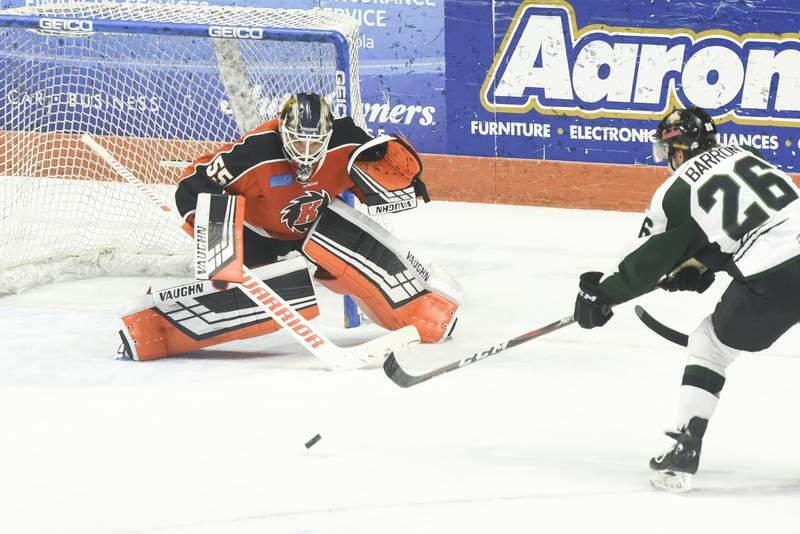 Brett Luke | The Journal Gazette Lukas Hafner of the Komets prepares to deflect a shot made by Travis Barron during the first period at Memorial Coliseum on Saturday night. 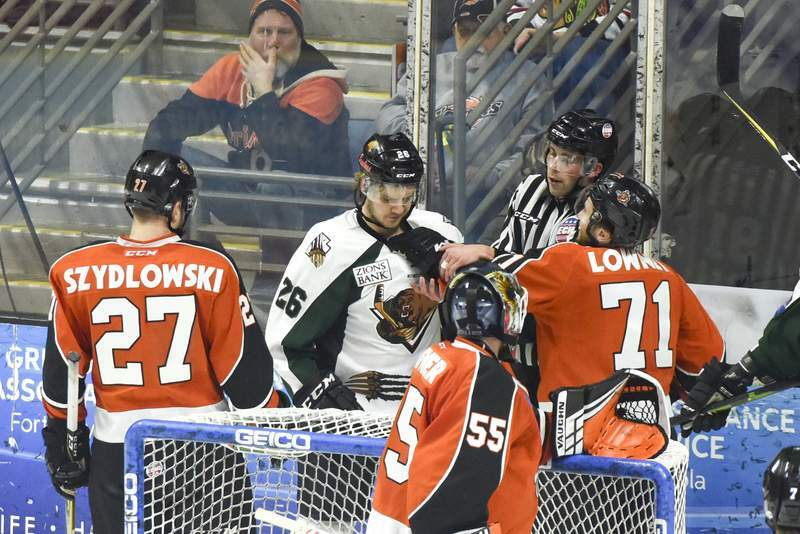 Brett Luke | The Journal Gazette Ryan Lowney of the Komets grabs Utah's Travis Barron by the collar during the second period at Memorial Coliseum on Saturday night. 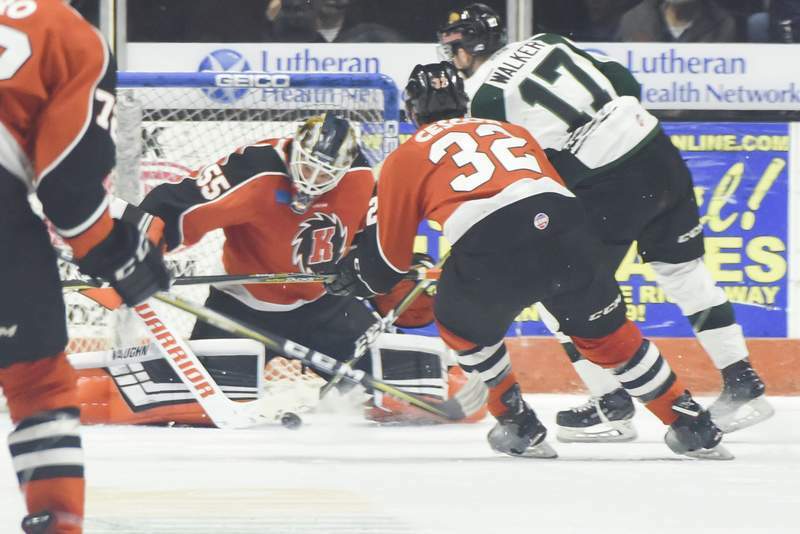 Brett Luke | The Journal Gazette Lukeas Hafner and Craig Cescon of the Komets stop Utah's Jack Walker from scoring during the second period at Memorial Coliseum on Saturday night. 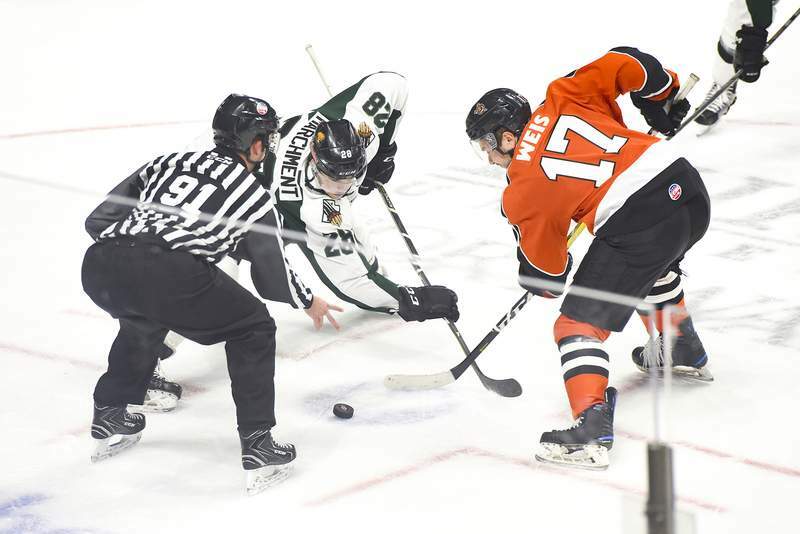 Brett Luke | The Journal Gazette Marco Roy of the Komets, center, passes the puck to teammate Brady Shaw during the first period against Utah at Memorial Coliseum on Saturday night. Brett Luke | The Journal Gazette Brady Shaw of the Komets fights for control over the puck with Utah's Jake Marchment during the second period at Memorial Coliseum on Saturday night. 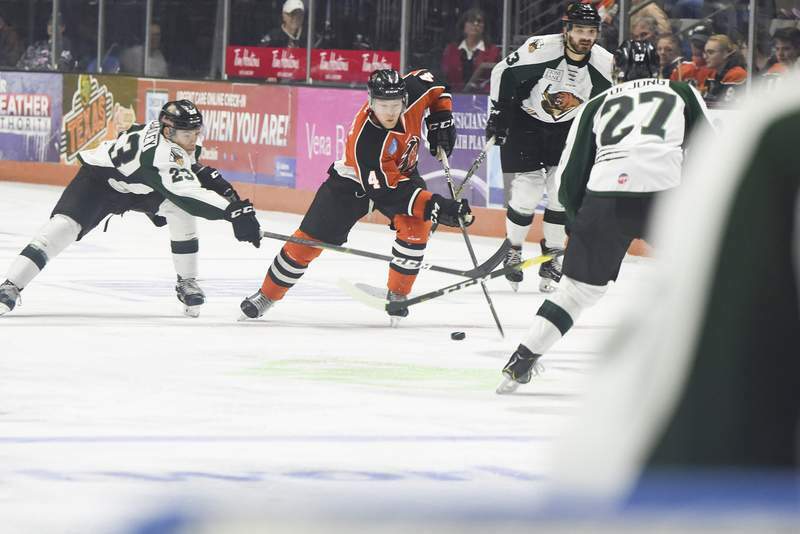 Brett Luke | The Journal Gazette Jason Blinkley of the Komets weaves through Utah’s defense during the second period at Memorial Coliseum on Saturday night. 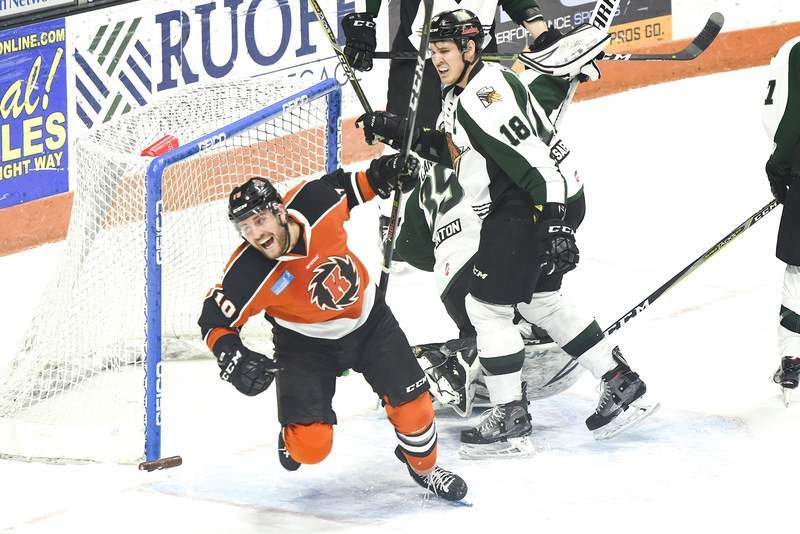 Brett Luke | The Journal Gazette Brady Shaw of the Komets turns and cheers after a goal by teammate J.C. Campagna during the first period against Utah at Memorial Coliseum on Saturday night. 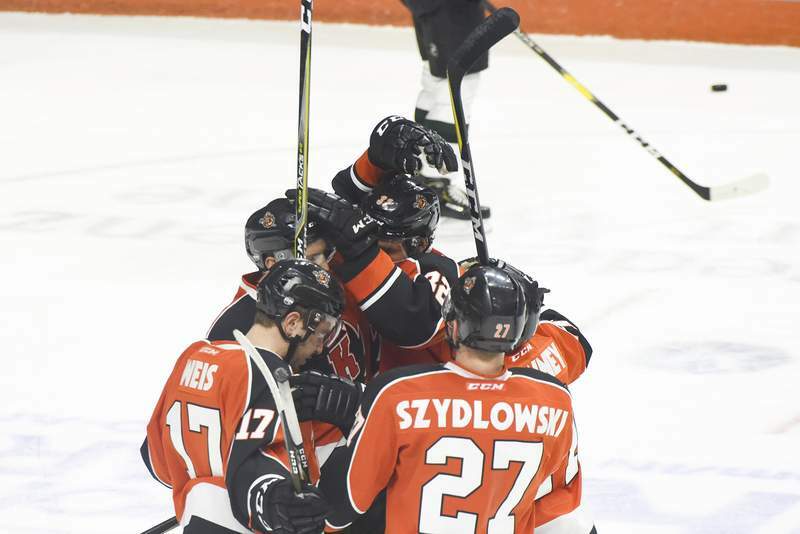 Brett Luke | The Journal Gazette The Komets celebrate after a goal against Utah in the first period Saturday night at Memorial Coliseum. 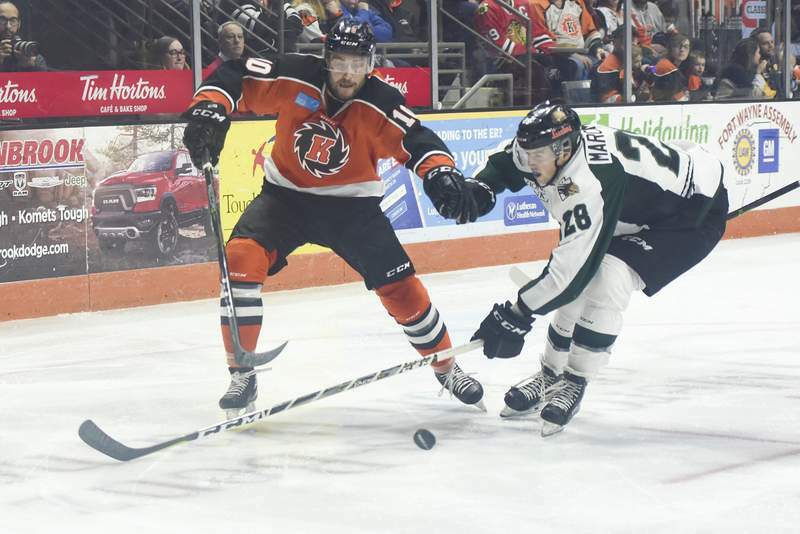 The Komets played host to Utah at Memorial Coliseum on Saturday night.